Richard: Welcome Lori. First of all, tell me a little bit about yourself. Lori: I have a PhD in Counseling, and I’ve been teaching at Bradley University in Illinois for 30 years . . . next week actually. I was chairperson of the Department of Leadership in Education, Human Services and Counseling for 12 years and currently Associate Dean of the College of Education and Health Sciences and co-director for the Center for Collaborative Brain Research. Richard: What excites you about your focus of study? Lori: What I think is really exciting is that the field of counseling is moving towards neurocounseling, bridging brain and behavior. We’ve always had this holistic wellness bent, but I think now we’re really trying to understand the physiology AND the neurology behind counseling. We know for sure that counseling talk therapy changes the brain, so let’s teach about that. I believe that’s how I got into it. Clients have an intrinsic locus of control. About 2010, we started the Center for Collaborative Brain Research at Bradley, and we’ve been doing some really fun, cutting-edge brain research pieces. We’ve had some trouble with funding recently, along with everybody in the universe, but it’s important that we know more about the brain—and it’s exciting!—so I love that I’m teaching. In fact, I’ll be teaching a class at 3.00 p.m., just after this interview, about neural feedback, to a group of honor students at Bradley. That’s one of my specialties. I’m board certified in neural feedback. Richard: When you say neural feedback, is this using the equipment that shows neural responses on a screen, so that they can learn to control their own brain activity? Lori: Yes, it’s based on the principles of classical and operant conditioning. I do quantitative EEGs (i.e., 19-channel EEGs), so I can see exactly what everybody’s brainwaves are doing. We create a pretest and work from that to do a lot of other things. We can customize neural feedback training to what the client needs. I know we will be discussing seasonal affective disorder (SAD) more specifically in a moment, but I think neural feedback is a potential intervention for someone if they really have chronic issues with SAD. Richard: Yes. I’m quite familiar with it. You might be interested in the work I’ve been doing with Dr. Ernest Rossi over the last 10 years or so, where we’ve been looking at gene expression and various other things that occur during therapy. Lori: How exciting! I think we need to teach people that a brain is just like any other muscle. It needs to be exercised and it loves to be challenged. So, when we challenge the brain, good things are going to happen—but you’re right, you have to have effort. Richard: Let’s just shift to the discussion of SAD now. Is there some reason why you were drawn towards it? Is it something that came up? And what was a little bit of the introduction of that into your experience? Lori: One of the things that Bradley lets us do is to consult for eight hours a week. I have a private practice with my husband, who’s a psychologist as well, which allows me to deal with people in my private practice. I see this consistently. I’ve been doing therapy for probably 30 years, and this consistently comes up. Clients will come and say “Perhaps I’m not clinically depressed,” but “I just don’t feel quite right”. I see this happening along with fall and winter, and they seem to get better in the summer time. Richard: What’s some of your approaches to depression? I suppose I’m pre-empting a little bit as a co-practitioner, because I’m a great believer that depression is not so much an illness as a message about something more important that we need to pay attention to. We spend so much time treating the illness that we forget to actually listen to the message. So how do you approach this? Lori: Sure. With neurocounseling one of the things we understand is that medication may be and can be needed. But I’m really a proponent of intrinsic locus control, and so we approach many things like depression more broadly. I want to be sure the person has a good understanding of what’s happening to them and is working with a functional integrative medicine physician. We have a team approach, and I first want to know if this is a physiological concern. So, they get a good screening, a good physical. Then I come back, and I want to know things from a wellness approach, such as, “Are you exercising?” They have to be exercising . . . and I’ll approach the brain piece in a second . . . but, if they’re not, I deal with that early on. This is part of neurocounseling where we teach them about important and interesting things like brain-derived neurotrophic factor (BDNF). Teaching them about that, and saying things like, “Come on, if you would exercise in the morning, you’re gonna have all this wonderful BDNF telling your body to wake up and go to town. And that’s how we feel better.” So I think we should talk to people about that. I also work really hard around nutrition. I connect them with a nutritionist, because I’m not a nutritionist, but the gut–brain axis is fundamental to mental health and well-being. People are fascinated to learn that there are more neurotransmitters in their gut than the brain—there is more of the neurotransmitter serotonin produced in our gut than in our brain. Understanding that what they’re eating is important is another great fundamental therapeutic need. I go for the whole gamma: nutrition, exercise . . . and I spend a ton of time, Richard, talking about sleep. Richard: Indeed. Sleep is fundamental. Lori: It is. In fact, I always tell my graduate students, “What do you think is more important: sleep, nutrition, or exercise?” The answer is that they are all important. Working on these basic things is where you can start so that, at the appropriate point, I can get into the brain. I’m a real proponent of shifting away from focus on mental illness and moving into brain health and brain illness. We can certainly do talk therapy; we know that therapy changes the brain, and there’s wonderful cognitive interventions for depression. I think that’s important. In addition, I want to talk a little now about neurotherapy, neurocounseling, and neurofeedback. Neurotherapy would be anything that modulates neurons. I can use neurofeedback to look into whether the client is clinically depressed. Depression sits in the left prefrontal cortex; anxiety sits here more in the right. With neurofeedback, I can check balances and teach how to self-regulate, just with neurofeedback. It’s not invasive and is very effective. With SAD, there are a lot of the other things that I’m doing with neurotherapies. One of the causes of SAD is the reduced amount of light that people are exposed to. We can prescribe light boxes to help resolve this. Are you able to do that in Australia? Richard: I’m not sure about that . . . although what about that fantastic light box that everybody can access free? Richard: You know, the outside! Lori: Definitely, go out for a walk, right? Richard: Yes. It’s interesting that that’s a problem in our modern world. Looking at SAD, what are some of the key elements that happen in the change of season that affect the body and the brain in this way, which triggers what feels like depression? Lori: I do agree that we don’t get outside enough. I am also very concerned about the effects of Iinternet technology on our mental state. The more we spend with I-technology the less we’re spending outside. But also, with the seasons changing, we don’t get as much sunlight. I don’t know about where you are in Sydney, but this is a horrible thing in Peoria, Illinois. We are up north at a longitude and latitude where almost everybody in Peoria has a vitamin D deficiency. Isn’t that horrible? Those kind of deficiencies are going to trigger seasonal affective disorder and getting outside doesn’t provide enough sunlight to help. Another thing that happens is the time change. Do you guys have time change in Australia? Lori: I find so many people come in to my private practice and say, “I just hate when the time changes.” This affects circadian rhythms. I also think the kind of foods we start eating in wintertime have an impact. We eat more carbs and more sugars. That impacts how we feel. People don’t get outside enough, and so we don’t have enough vitamin D in our system. Winter gets pretty cold here, with a fair amount of snow, and we like to snuggle up, which means we’re not active enough. I think all those things make such a difference. Richard: Reducing exercise and increasing carbohydrate and refined sugars can certainly lead to some weight gain, with the subsequent rise in cortisol levels. Also, perhaps, some rise in insulin resistance, which can negatively affect mood as well. It’s not easy to deal with. 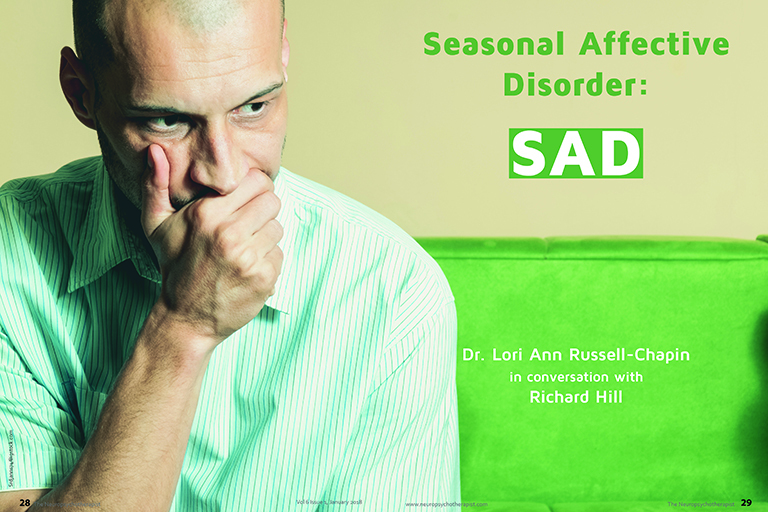 What are some of the ways in which you find that seasonal affective disorder presents itself as a mental health issue? Lori: It’s interesting to me, and it’s hard for me to say as a female, but it typically does affect women more than men. I think it presents itself in men and women, although not young kids, but usually about 4 years of age and up. We get a little more irritable, or might have angry outbursts. Some people say, “I just don’t want to leave my house.” That sounds much like clinical depression. Those are the most common things that I see: people are more irritable; they don’t want to socialize as much; it’s like they shut down, which is truly a symptom of depression. Richard: When you actually look at the anthropological aspects of things, there are so many fascinating things that we do so wrong because, as you say, in winter we tend to eat more carbs. We tend to lay around. Actually, over evolutionary time, what happened in winter is that we ate less. We stored fats in the summer, so that we could manage the hibernating effects of the colder winter conditions. We’ve got a lot of things in modern society and in our social structure a bit backwards. What are some of your thoughts about the way we live nowadays that also lead to SAD? We can get that full spectrum light to people in a number of ways. In our private practice, we have purchased these very cool-looking visors. There’s 10 thousand LUX in this little visor. You can vacuum with it; you could walk around the house with it. People will do that for about 30 minutes every morning. For those who have them, many of their symptoms of SAD will disappear. There’s also the LUX light that will sit on your desk. That is not as practical because you have to sit in one place, but if you use the visor, you can move with it. Now we have included another benefit of adding more movement, so we’re doing two things. I think education about SAD is extremely important. Richard: You’ve mentioned that one of the key things is exposure to light. Let’s explore that a little bit more deeply, a little more technically, perhaps, and look at vitamin D. What are some of the things you can tell us about the importance, and the process, and the functions of vitamin D? Lori: This aspect is not my expertise, although there is a lot of good information available. Essentially, our body doesn’t store Vitamin D and so needs to continually manufacture it. Sunlight is important in manufacturing vitamin D. So that’s why, if you can’t get into the sunlight, or you’re living where it is very cloudy, then the LUX lights are valuable. You can also take supplements to increase vitamin D within the body. Vitamin D deficiency affects people physiologically. They can feel lethargic, like they just can’t get up. Now we’re moving right back into depression again. This is why everybody I see in my private practice requires a physical. I need to know what’s going on physiologically. Once I know the nature and extent of the physiological concern, I know what to do in the context of neurocounseling. Richard: As a motivation, SAD seems to be giving us the message to get up, get active, and go outside. Lori: That’s what it’s saying, but it seems to be counterintuitive, because you don’t feel well and also lethargic, which are not good conditions for being motivated. That is why it is helpful to educate people. I know a lot of clients who are made to feel like they are just malingering or lazy. I’m so happy that you are talking about this, because it’s not true. I have clients who consistently get depressed at certain times every year. Through education, we can make people aware of what is happening, and give them things that they can do. We really need to teach people what they can do. Richard: I certainly have been interested in this issue for some time, too. The technical aspects of what happens when sunlight hits the body are quite incredible. The passage of Vitamin D through the body is so interesting. Lori: Tell me more! I want to hear what you’ve learnt. Richard: Well, the nature of Vitamin D is complex. We ingest it from a variety of foods like eggs, fatty fish, mushrooms, and some cheeses, but that’s not the main source. Most of it comes from the sun. The sun’s ultraviolet light (UVB) is converted just under the skin, in an interaction with cholesterol, to form 7-dehyrocholesterol and then cholecalciferol, or vitamin D3. Vitamin D goes through two more changes as it goes through the whole system. It is converted in the liver to 25-hydroxy-D3 and then through the kidneys to become 1,25-dihydroxy-D3. So it goes through three different processes that are all functionally useful in different ways. It’s functionally useful in working with calcium for bone health. But when it becomes 1,25-dihydroxy-D3, it acts to induce transcription factors in gene expression in the brain. It could be responsible for the expression of as many as 2,000 genes in the brain relating to brain development and ongoing functions. It’s pretty darn important. Lori: That’s the psychoeducational piece that I think people need to know. Maybe the average person isn’t going to want to know all those details; but if they understood how important it is, then I think that helps the client take back the intrinsic locus control. This is how people can learn to help themselves, rather than always using some extrinsic medication to take care of everything. In America, we do tend to love our medications. That’s my answer to your question . . . How do I convince people that they can have some control over their seasonal affective disorder? I do something that makes their own capacities self-evident. Once people understand that basic concept, they are receptive to suggestions that exercise is important, that getting outside is important, and they are open to understanding that vitamin D would be helpful. They feel empowered, and, then, they don’t want to take medication as a quick fix. Richard: Once you show them how to pick up one stick, they’ll start picking others. Isn’t it fascinating that people are surprised that they can do stuff for themselves? There’s a big cultural issue of giving in to external controls. My main thesis is about the neurobiological and biological effects of curiosity. There’s a thing that was researched by Aronson and Steele at Stanford in the 1990s called “stereotype threat”, which is, essentially, the stereotypical attitudes that pervade the background assumptions of a culture. All too many people simply do not believe that they are capable of self- determination. It’s an idea—an attitude—that inhabits their thinking non-consciously. We can even see a socially induced attitude when your client felt that teaching them to breathe is so simple, you shouldn’t charge much money for it. Lori: Exactly. In fact, it can change your life if you learn how to breathe. Teaching them in a non-threatening way what can happen in their physiology . . . well, we’re back to your curiosity. They become curious. “If this happens to my body just with breathing, what else can she teach me?” And I love that. It’s so much fun. In my private practice office, I have all these cool brains and things. And people like to pick them up and look at them. They are mildly curious. But after I teach them a little bit about the brain, they become extremely curious. That opens the opportunity for me to go further. “Well, you know what? Let’s talk about exercise . . . let’s talk about the things you’re eating . . . let’s talk about your thoughts that are engaged with being depressed.” That’s the little battle that helps me win the war. Richard: I love it, too. It’s almost impossible to be depressed and curious at the same time. Lori: I agree, and that’s so cool! If I can make them curious, we’ve shifted the locus of control, even if only a little bit. Another lady told me that she felt like she was almost levitating out of my office. She had made a major discovery, “Wow, if I can do this, I can do anything.” I love that feeling. I love that. Lori: The thing I’m doing today in class, which is another great example and I could use your expertise in this. Have you ever heard of the instrument RESPeRATE®? Lori: So, I’m teaching RESPeRATE today. It’s the only FDA-approved instrument in the United States for blood pressure control. I use it for diaphragmatic breathing. That’s another one for me—we expend so much money on medicine for blood-pressure control, when in fact we have the capacity do that for ourselves, at least to some degree. And now we’re back to seasonal affective disorder. If I can help you breathe better, and you’re feeling calmer, and then you go for a walk, then you’re going have more energy and interest to go out, and that is a treatment for SAD. All these things are directly related to each other. Richard: These bits of equipment are really good. I mean, the resperator is really terrific, but you can do a certain amount of this work yourself just with a blood pressure sleeve. Put the sleeve on, check it in, do something, look at the sleeve after, you can get indications in easy ways. These sort of things are accessible, but, although we end up being able to do things by ourselves, we are in the cultural or generational state where we need some assistance . . . we need someone to give us a hand. This is the work that you’re doing. Lori: It’s hard to say exactly what to call us: social workers, psychologists, counselors, coaches . . . I think of us as social beings. I think it’s enough to know that we have a positive role in people’s lives. Another simple tool that I’m convinced helps with SAD is heart rate variability. We’re continuing to be interconnected to you, but if you can teach people to breathe through their heart, and provide more oxygen to the brain, I’m guessing that you would have some effect on the debilitating aspects of SAD. Richard: A lot of what you’re saying is to do with the nature of inspiring the brain to feel biologically healthy? Richard: When the neurons in the brain . . . because of the various biochemicals, or what I describe as the current biochemical milieu, when it creates an environment where the neurons don’t feel “well”. Creating some sort of change can be enough to alter the outcome of the neuronal system and change the biochemical milieu. How much are we suggesting that SAD is an outcome of the environment that you’re living in that is giving you this biological response in the brain? Lori: That, Richard, and also the education. If we could educate people to understand that process, wouldn’t that be great? Because they would be more empowered to say, “Here’s what I can do.” It can be a powerful change. I think there are many tools that we can use to help people be more inspired—I like that word—and be more curious. This helps them to get up and take care of themselves. I’m not sure if you can write this, but I have a colleague who put it rather bluntly, “You know, only you can poop for you.” And I thought, that’s so good. Seriously, that’s so good.